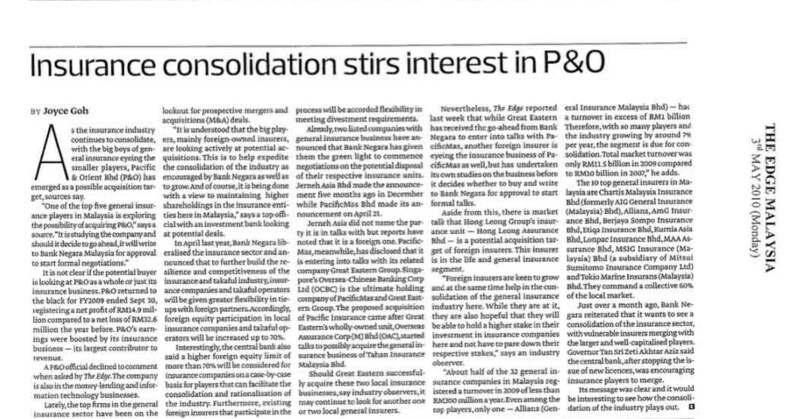 Insurance consolidation stirs interest in P&O. May 3, 2010. By The Edge Market Malaysia. As the insurance industry continues to consolidate, with the big boys of general insurance eyeing the smaller players, Pacific & Orient Bhd (P&O) has emerged as a possible acquisition target, sources say. It is not clear if the potential buyer is looking at P&O as a whole or just its insurance business. P&O returned to the black for FY2009 ended Sept 30, registering a net profit of RM14.9 million compared to a net loss of RM32.6 million the year before. P&O’s earnings were boosted by its insurance business — its largest contributor to revenue. A P&O official declined to comment when asked by The Edge. The company is also in the money-lending and information technology businesses. Lately, the top firms in the general insurance sector have been on the lookout for prospective mergers and acquisitions (M&A) deals. “It is understood that the big players, mainly foreign-owned insurers, are looking actively at potential acquisitions. This is to help expedite the consolidation of the industry as encouraged by Bank Negara as well as to grow. And of course, it is being done with a view to maintaining higher shareholdings in the insurance entities here in Malaysia,” says a top official with an investment bank looking at potential deals. In April last year, Bank Negara liberalised the insurance sector and announced that to further build the resilience and competitiveness of the insurance and takaful industry, insurance companies and takaful operators will be given greater flexibility in tie-ups with foreign partners. Accordingly, foreign equity participation in local insurance companies and takaful operators will be increased up to 70%. Interestingly, the central bank also said a higher foreign equity limit of more than 70% will be considered for insurance companies on a case-by-case basis for players that can facilitate the consolidation and rationalisation of the industry. Furthermore, existing foreign insurers that participate in the process will be accorded flexibility in meeting divestment requirements. Already, two listed companies with general insurance business have announced that Bank Negara has given them the green light to commence negotiations on the potential disposal of their respective insurance units. Jerneh Asia Bhd made the announcement five months ago in December while PacificMas Bhd made its announcement on April 21. Jerneh Asia did not name the party it is in talks with but reports have noted that it is a foreign one. PacificMas, meanwhile, has disclosed that it is entering into talks with its related company Great Eastern Group. Singapore’s Oversea-Chinese Banking Corp Ltd (OCBC) (Valuation: 2.55, Fundamental: 2.20) is the ultimate holding company of PacificMas and Great Eastern Group. The proposed acquisition of Pacific Insurance came after Great Eastern’s wholly-owned unit, Overseas Assurance Corp (M) Bhd (OAC), started talks to possibly acquire the general insurance business of Tahan Insurance Malaysia Bhd. Should Great Eastern successfully acquire these two local insurance businesses, say industry observers, it may continue to look for another one or two local general insurers. Nevertheless, The Edge reported last week that while Great Eastern has received the go-ahead from Bank Negara to enter into talks with PacificMas, another foreign insurer is eyeing the insurance business of PacificMas as well, but has undertaken its own studies on the business before it decides whether to buy and write to Bank Negara for approval to start formal talks. Aside from this, there is market talk that Hong Leong Group (Valuation: 2.55, Fundamental: 2.20)’s insurance unit — Hong Leong Assurance Bhd — is a potential acquisition target of foreign insurers. This insurer is in the life and general insurance segment. 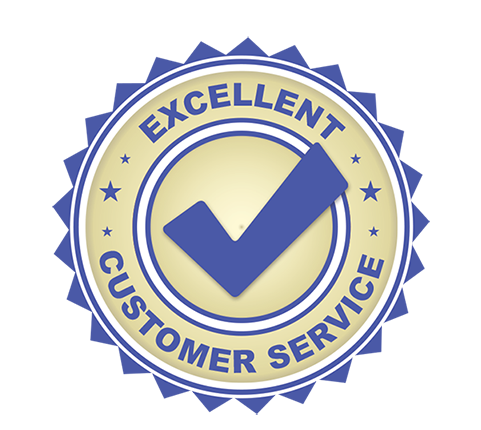 “Foreign insurers are keen to grow and at the same time help in the consolidation of the general insurance industry here. While they are at it, they are also hopeful that they will be able to hold a higher stake in their investment in insurance companies here and not have to pare down their respective stakes,” says an industry observer. “About half of the 32 general insurance companies in Malaysia registered a turnover in 2009 of less than RM300 million a year. Even among the top players, only one — Allianz (General Insurance Malaysia Bhd) — had a turnover in excess of RM1 billion. Therefore, with so many players and the industry growing by around 7% per year, the segment is due for consolidation. Total market turnover was only RM11.5 billion in 2009 compared to RM10 billion in 2007,” he adds. The 10 top general insurers in Malaysia are Chartis Malaysia Insurance Bhd (formerly AIG General Insurance (Malaysia) Bhd), Allianz, AmG Insurance Bhd, Berjaya Sompo Insurance Bhd, Etiqa Insurance Bhd, Kurnia Asia Bhd, Lonpac Insurance Bhd (Valuation: 1.65, Fundamental: 2.10), MAA Assurance Bhd, MSIG Insurance (Malaysia) Bhd (a subsidiary of Mitsui Sumitomo Insurance Company Ltd) and Tokio Marine Insurans (Malaysia) Bhd. They command a collective 60% of the local market. Just over a month ago, Bank Negara reiterated that it wants to see a consolidation of the insurance sector, with vulnerable insurers merging with the larger and well-capitalised players. Governor Tan Sri Zeti Akhtar Aziz said the central bank, after stopping the issue of new licences, was encouraging insurance players to merge. Its message was clear and it would be interesting to see how the consolidation of the industry plays out. P&O to start talks on stakes sale. Prudential said to be eyeing P&O.